Disney and Madhouse have teamed up to create an anime series using the popular Disney character Stitch. 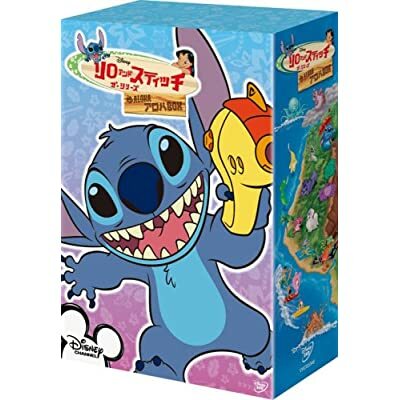 The series takes place on a fictional Japanese island where Stitch is now paired up with a new girl named Yuna. Jumba and Pleakley are with him and the original TV series villains Dr. Jacques von Hamsterviel, Experiment 627, and Leroy will also be seen as well as Ruben and Angel. There's apparently a new character in the form of a yellow ducky. The series is scheduled to air in Japan on October 8. My eyes and ears burn! Y'know, this'll get dubbed and come right back and hit us in the face. What's weird is that Stitch looks like he's either been cut out of the regular show and put into this, or these new "characters" have been superimposed over the old show. That duck-thing just doesn't look really there. Ya never know, Ben, this could be good for a laugh. Unintentional laughter counts, right? In some parts, Stitch sounded very close to Chris Sanders; different from the before clip. Also, seeing different people interact with Stitch, Jumba and Pleakley - ie Hanako - reminds me when Lilo and Stitch: The Series had crossovers. For anyone curious, the shows story is imaginary, as the company said in a statement. Makes me happier. Oh my godness ,who's this Lilo wannabe? I want the real Lilo! not this Japanese wannabe Lilo should throw her to the ocean or something. Last edited by Once Upon A Dream on August 31st, 2008, 8:02 am, edited 1 time in total. Now, now, there's no reason to be cruel. It is what it is. A logical step, considering the background to the characters, and a wonder that it 1) wasn't done to death by the original series, and 2) why it hasn't been done before now. Stitch was ripe for the Pokemon treatment, but it never really came. With this, they get the chance to "start again" with an "imaginary" alternate universe. It may not be "art", heck it may not strictly feel "Disney", but it was always going to happen. eddievalient wrote: Now, now, there's no reason to be cruel. Now if only Region 1 would follow suite. The cool thing about the spine, is when you collect all four and set them together, it creates a picture of Maui. Oh,that's neat I wonder if other Disney animated shows will have boxsets like that (Especially The Little Mermaid series),live actions shows seems to get boxsets like that (Like Hannah Montana now). I only have seen the episode with Experiment 627 and I have Stitch:The Movie on DVD. Does other Disney character will go anime too? (Hopefully not). I liked it better when it was just the first lilo & stitch movie. I love love love Lilo & Stitch. The TV series is awful, as is the movies based on the tv show. Dr. Hamsterville or however you spell it is a stupid villian. I hate the idea of all the other experiments just being different versions of stitch. I hate the animation, i hate the way stitch looks on the TV show (he's not drawn the same). The only good thing about the show is Jumba because it's hard to not make that voice funny. As for the movies... well i hate them. And so they took what I hate, and made into an ANIME. Not only did they make it into an anime, they took away the other human characters, specifically lilo, and made a dumb generic anime looking girl. god. why. I don't care that it's "Imaginary". It's stupid. The only thing that came after the original movie that was any way decent was Stitch has a Glitch. The animation was great, and everything was a good continuation from the first movie. The only thing that really ruined that movie was Dakota Fanning. She absolutely ruined Lilo with her over acting. Last edited by Macaluso on August 31st, 2008, 2:47 pm, edited 1 time in total. And I agree about Dr. Hamstervile,he's on the lamest Disney Villains ever. I love Dr. Jacques von Hamsterviel! I found him annoying at first, but he grew on me. I even have a plushie of him. Well,he might be better in the series but he's very annyoing in Stitch:The Movie.